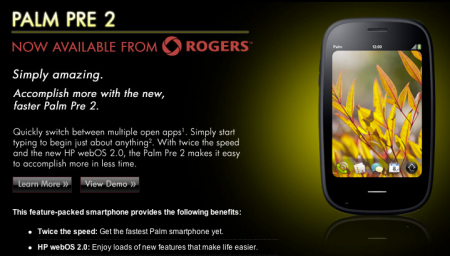 HPs Canada: Palm Pre 2 on Rogers 'Now Available'; Update: Available! PreCentral reader Sean points us to this page on HP's Canada site claiming that the Palm Pre 2 is "Now available from Rogers." That the Pre 2 is hitting Rogers is no surprise at all given that there are already dummy units (with dummy pricing) on display in stores. A quick perusal of Rogers' website doesn't yield up the ability to purchase the webOS 2.0 wonder; ditto for Palm's Canada site. Can we just announce and officially release this thing so we can get back to our other weird Pre 2 release question? To wit: figuring out why the Verizon Pre 2 was pulled from big V's internal systems and dummy units pulled from stores. We still think the Pre 2 will hit Verizon in the "coming months," but have to admit it's frustrating watching Palm, Rogers, and Verizon soft-pedal this launch. Update: Kevin points us to the Pre 2 page on Rogers. It's $99.99 Canadian with a 3-year contract, $349.99 at 2 years, $399.99 on 1-year or month-to-month. Thanks Kevin! Source: HP Canada, Palm Canada, & Rogers; Thanks Sean!